David C. Berliner, Regents Professor Emeritus of education at Arizona State University and co-author of the recently released book “50 Myths & Lies That Threaten America’s Public Schools,” gives a no-holds-barred interview on the policies, practices and popular beliefs that he believes are the greatest threats to Arizona’s public schools and shares his thoughts on how schools can better serve children. Berliner, who previously taught at University of Arizona, University of Massachusetts, Stanford University, and universities in Australia, Canada, the Netherlands, Spain, and Switzerland, is a past president of the American Educational Research Association and the Division of Educational Psychology of the American Psychological Association. 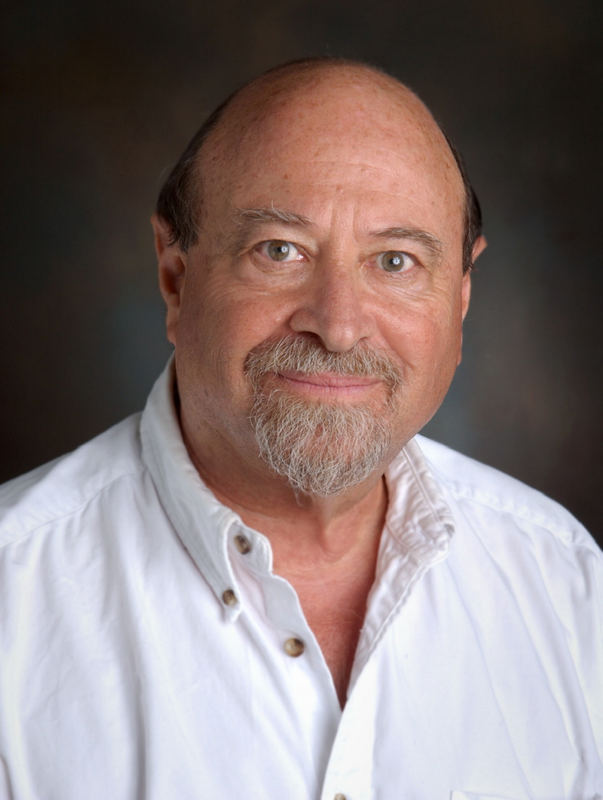 His co-author was Gene V Glass, also a Regents Professor Emeritus of education at ASU. Q: What three policies, practices and popular beliefs mentioned in the book affect Arizona’s public schools most? A: The first and most important myth is that American students do not do well in international competition, which shows how poor our schools are. This is complete nonsense. If you start to break up the scores of kids on the tests into five groups – one of which are kids that go to schools where less than 10 percent of the families are in poverty, and another group of schools where less than 25 percent of kids are in poverty –in the last big international test scores, the PISA, those kids actually scored among the best in the world. In reading, they scored almost better than anyone else. Even in mathematics, which is not our strongest area in the U.S., they scored terrific. It’s the other end of the spectrum – kids who go to schools where there are over 50 percent in poverty or at schools where there are over 75 percent of kids in poverty – they’re doing terrible. 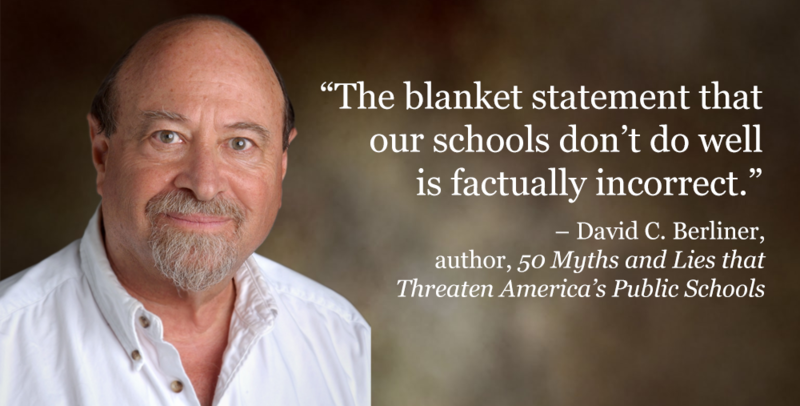 The blanket statement that our schools don’t do well is factually incorrect. The proper statement is that some of our schools are not doing well, and almost all of them are schools where poverty is endemic. The second one that I would touch on is the absolutely stupid policy passed by our Legislature (Move on When Reading) to hold kids back if they are not reading well in third grade. There is no better set of research in education than in that area. We know quite factually, as certainly as we know evolution and as well as we know global warming, that leaving a child back is a wrong decision for almost all of them. It’s a mistake. The child who is left back has a much higher chance of dropping out of school. They don’t like school. When those students are interviewed, they call up the equivalent of wetting their pants in school, or losing a parent, or going blind. It’s a horrible occurrence for the family. What’s more, the state has committed itself to putting in another approximately $8,000 because to leave that child back, means one more year of elementary school. If they used that $8,000 for tutoring of the kid, you wouldn’t have to leave the kid back. The kid wouldn’t drop out of high school. The kid wouldn’t be a negative force in classrooms and wouldn’t be overage for their grade. You’d be much better off. The third one I’d suggest is one promulgated by Arizona’s own Goldwater Institute, in which the president of the Goldwater Institute says early childhood education is no good. There are studies out showing that for all kids high-quality early childhood education makes a difference in their lives and for poor kids in particular it has really profound effects. Those are three areas where Arizona, in particular, has got it all wrong. Q: Which specific funding issues identified in the book need to be addressed most urgently and how? A: There are a number of parts to this. 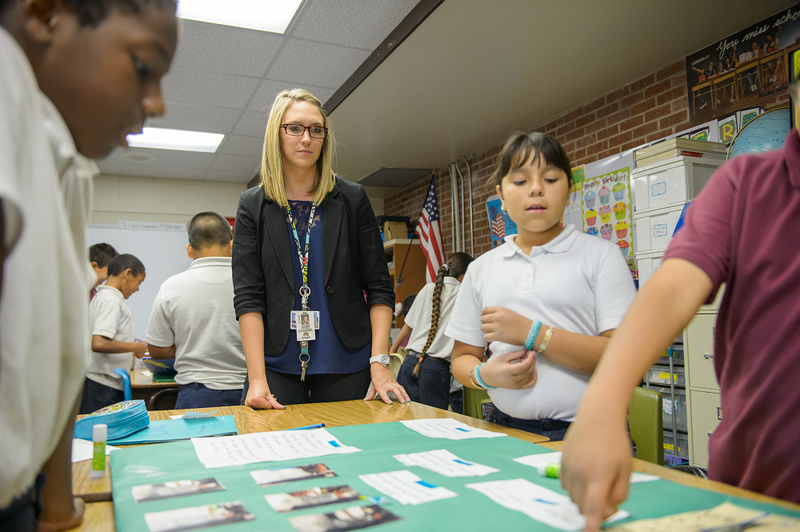 Number one, teacher salaries in Arizona have gone way down. Other states, while they had to rescind some salaries during the recession, have restored them. During the recession, Massachusetts’ teachers’ salaries went up. You cannot attract the best and the brightest to the field even if they want to be teachers, if you don’t pay them enough for the starting salary. 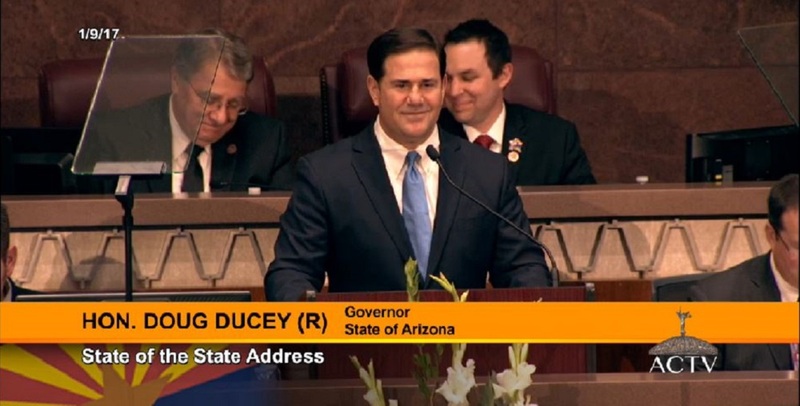 Maybe even worse for the long-term in Arizona is that state funding for the three state universities has gone straight down for the last 20 years while the demand for higher education and the demand for educated workers is up. You can’t have a future in a knowledge economy without people possessing knowledge. Also, we have not restored the funding that the state gives to school districts either. So we’ve had to cancel art and music classes, we’ve had to cancel a lot of special services for kids who need them, and after school programs, etc. Not only have you hurt who you can attract to the field, but you’ve actually hurt the systems themselves. Funding matters a lot. Other states are way, way ahead of us. Q: You have identified a group of college-and-career ready “myths and lies.” What is the most prevalent issue related to this that you identify in the book? A: We don’t think most people know what career- and college-ready means. What we need is certainly a literate workforce, a numerate workforce, a scientifically literate workforce, but we’ve always needed that. I don’t think that’s anything new. What we really need to save our state and our nation is a population that takes its role in citizenship seriously. We are more likely to lose our pre-eminence as a nation because of apathetic voters than anything else. Q: How can schools better serve children? A: Schools could be better if they were, in our more modern times, more encompassing of the child. That means more after-school programs, because lots of families are not home for kids after school. It could be homework areas for kids with tutors, it could be sports, it could be music, it could be art. There’s a fascinating study that says when people reach the age of 55 or so, which is usually around the peak earning parts of their lives, people who have studied the humanities out-earn people who have gone into business. But what we see all over America is the cutting of the humanities – less government, less history, less art, less music. What we’re doing is cutting off our humanities, when we need to keep them. We need the journalism club. We need the music classes. We need the art classes. That would make some schools better, but it also makes kids want to go to school. I bet very few kids want to go to school to study mathematics. I bet lots of kids want to go to school to be part of the music program, the art program, and the sports program. What you want are the hooks to keep kids in school, and those are the ones that we’re getting rid of. Every parent knows this, and every legislator doesn’t care. Q: “Myths and lies” is a pretty inflammatory title. Why did you choose this as a way to discuss the serious issues facing America’s and Arizona’s public schools? A: A good deal of what’s promulgated is self interest. 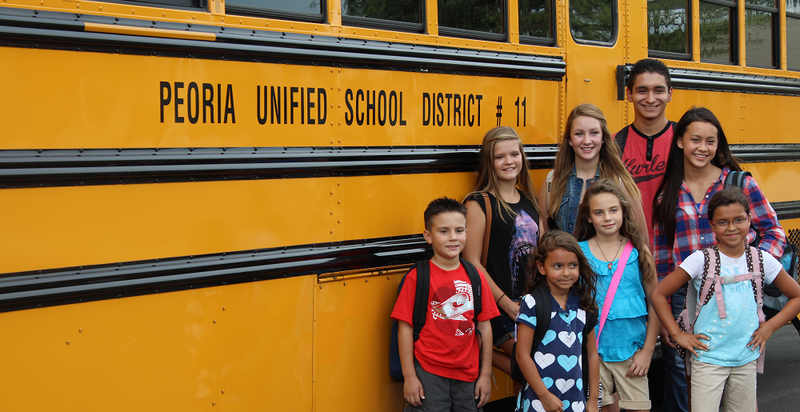 School uniforms companies tell everyone learning improves if you wear uniforms. Not true. Your laundry bill may improve, though. Other companies sell iPads, and say it will help kids do better in school. Well, there’s no evidence of that. Another part of it is simple failure to understand the research base. Like the passage of Move on When Reading.